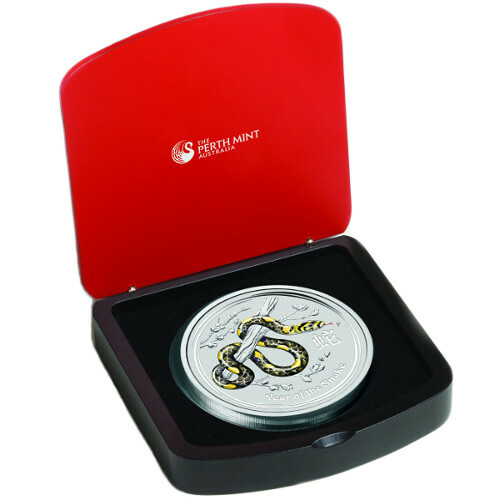 The Year of the Snake arrived in 2013, and the Perth Mint celebrated with yet another stunning release in its ever-popular Lunar Series II program. These coins are particularly coveted by collectors because of their low mintages and changing designs each year. The 2013 1 Kilo Colorized Silver Australian Snake Gemstone Eye Coin is available today on Silver.com. Ships to you in a black display box with a CoA. Sixth release of Lunar Series II. Issued a face value of $30 (AUD) by the Australian government. Year of the Snake design on the reverse. Lunar Series II coins followed the popular Lunar Series I program from the Perth Mint. Launched in 1996, these coins featured simpler designs for each of the 12 years on the Chinese Lunar Calendar. At the conclusion of that program, the Perth Mint launched Lunar Series II in 2008. Each of the new coins in this release schedule features an intricate design for the given year on the Zodiac. 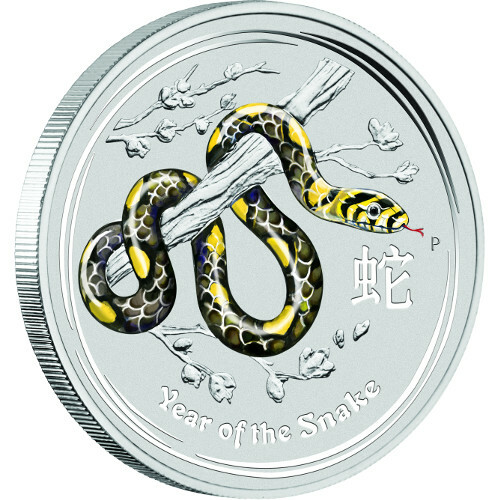 For the Year of the Snake, this coin has a special colorized finish and unique gemstone addition to the design. 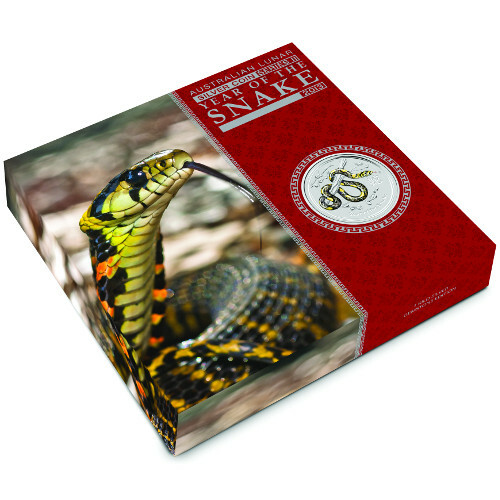 On the reverse of the 2013 1 Kilo Colorized Silver Australian Snake Gemstone Eye coin you’ll find the exclusive 2013 Year of the Snake design, which includes a snake coiled around the branch of a tree and dangling down. 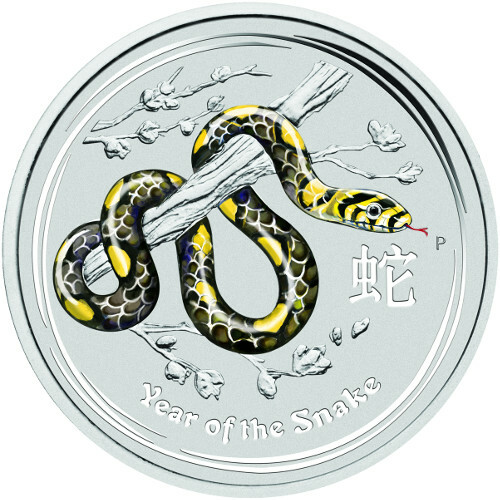 The engravings of “Year of the Snake,” “P” for the Perth Mint, and the Chinese symbol for snake are included on this face. You’ll also notice as you look at the snake’s lone visible eye that there is a gemstone inside of it. Perth Mint added a black diamond into each of these 2013 1 Kilo Colorized Silver Australian Snake Gemstone Eye Coins to symbolize wisdom. 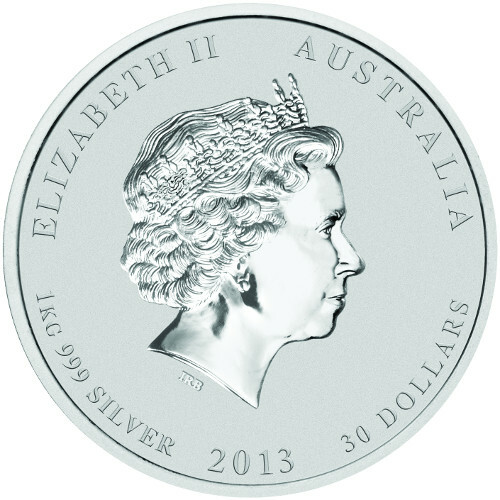 On the obverse of all coins in the Lunar Series II program is the effigy of Queen Elizabeth II. Created in 1998 by Ian Rank-Broadley, this design represents the fourth-generation depiction of Her Majesty since she ascended to the throne in 1952. Perth Mint is a world renowned facility originally opened in 1899 as the third and final Royal Mint facility in Australia. Today it is a state-owned entity of Western Australia, and it operates independent of the newer Royal Australian Mint, which was founded as the sovereign mint in 1965. We encourage Silver.com customers to contact us with any questions at 888-989-7223. You can also reach us on the web through our live chat feature or email address.